When logging into the cloud server management interface, you are presented with your account dashboard. 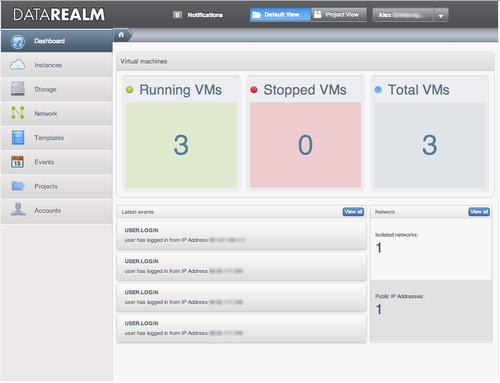 At a glance you can see the status of all the cloud servers within your virtual network. After you log in for the first time, one of the first tasks you will want to accomplish is launching a new cloud server. This is an extremely easy task. From your browser just follow the guided steps, making selections such as what operating system template to use along the way, and your cloud server will be online in minutes! 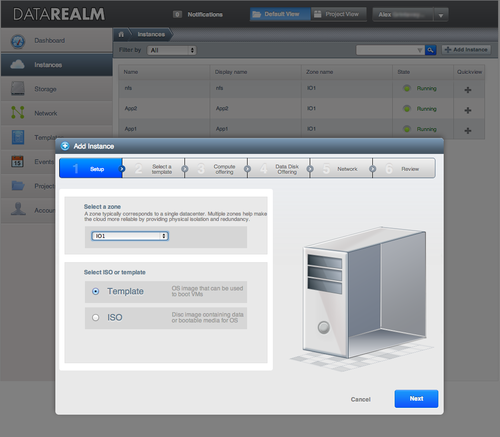 Datarealm's cloud has EXTREMELY powerful networking features built right into it. All of our cloud servers share their own private network. 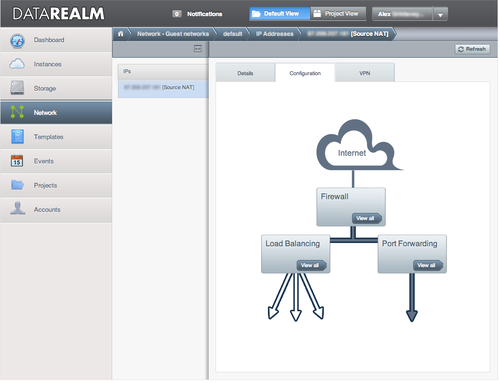 Use the network screen to setup firewall rules for your IP addresses and port forwarding to each of your cloud servers. You can also use this screen to configure the included load balancer to share workload amongst multiple cloud servers within your private network. Are you a security freak? Lock down access by configuring VPN access! Volume management offers many useful and time saving features. From existing volumes you can create snapshots (instant backups), and even schedule routine snapshots to be taken. For extremely important data, go ahead and download volumes and/or snapshots to store on your own computer. If you need additional storage you can create a new data disk or resize an existing one. You can even detach and move data disks between your cloud servers. Tweaking out a system to your own likes and needs can take some time, and no one likes to repeat the process. 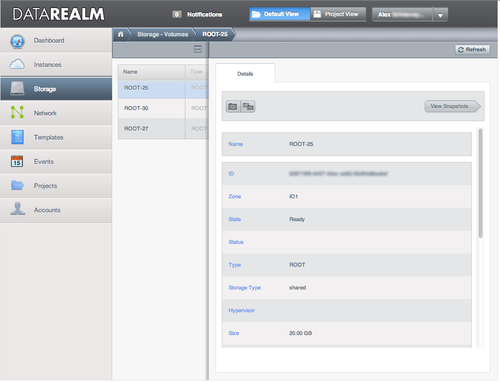 Once your first cloud server is configured the way you like, use it to create your own system template. The next time you need a new cloud server, use your customized template and the system will launch ready to use. This can be an incredible time saving resource!